DCIS is a common finding at breast screening. It is the earliest form of breast cancer, where abnormal cells are found in the ducts of the breast. 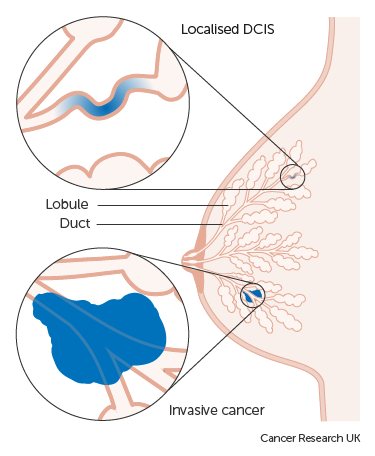 LCIS is not as common, but still a significant finding, where abnormal cells are found in the lobules of the breast. Non-invasive means that the abnormal cells haven’t spread any further than the ducts or the lobules of the breast into any normal surrounding breast tissue, but there is an increased risk of developing invasive breast cancer later on. Atypical hyperplasia is a benign breast lesion characterised by cells in the breast increasing in number and developing an unusual shape, so that they look abnormal or ‘atypical’. It has been shown to increase the risk for future breast cancer. In the past, clinicians weren’t sure of the best ways to treat DCIS and atypical hyperplasia and what impact they would have on women. That’s why the Sloane Project was set up. The project was named in memory of Professor John Sloane, a highly regarded pathologist with a great interest in DCIS. The aim of the audit is to better understand the diagnosis, treatment and clinical outcomes of these conditions to help patients and healthcare professionals make more informed choices about treatment in the future. We have achieved a participation rate of 87% of all UK Breast Screening Units, who have submitted data into the project on more than 13,000 patients. This is an enormous achievement considering that the audit has always been voluntary. We’re very grateful for everyone’s hard work to enable this. By 2012, we had far exceeded our goal of collecting data on 10,000 cases of DCIS, so stopped collecting primary DCIS data to concentrate on collecting outcome data for these cases. But we continue to collect cases of atypia. The project has been funded via a variety of routes over the years. Members of the public have also contributed via fundraising events such as golf charity days, pub quizzes and even Sloane fundraising balls. In more recent times we have received a continued commitment to funding and support from Public Health England. We have published 9 peer-reviewed papers and given presentations and posters regionally, nationally and internationally. Results from the audit have already had an impact on the diagnosis and management of DCIS in the UK and around the world. But the journey doesn’t end there. I am really excited that Cancer Research UK (CRUK) has agreed to give an award on behalf of CRUK and the Dutch Cancer Society for £15 million to an international consortium made up of colleagues from the Netherlands, the US and the UK. The Sloane Project forms part of the UK consortium. The award is to do some ground-breaking research looking at how DCIS evolves. By collecting DNA, RNA, and protein using a range of formats, it is hoped that we will be able to understand a woman’s risk of developing a recurrence of DCIS or progression to invasive disease. This should help clinicians decide whether to treat DCIS or leave it alone.